Dogs are becoming more intelligent and are even learning morals from human contact, scientists say. Dogs are amazing creatures. They are able to lead blind people through noisy streets, bring the wayward sheep back to the herd, and can be trained to do everything from fetch a ball to detecting cancer. Dogs have been known to do some interesting things, but one dog is more adorable, every day he goes shopping on his own, coming back with his basket of food. Meet Zoei, a 4-year-old Golden Retriever who goes shopping for her favorite food, and she knows just where to find them! Everyone love Zoei, She's is a girl who knows what she wants. And she's is not afraid to go and get it. As soon as she gets her food, she just runs back home. Of course, Zoei not only gets her food for free. She goes with the cash in a wallet and pay for her food. If you have a dog, do you believe it can handle going shopping all by itself? Take a look video and you will be amazed what a man best friend can do! DoglopedixDogs are becoming more intelligent and are even learning morals from human contact, scientists say. Dogs are amazing creatures. They are able to lead blind people through noisy streets, bring the wayward sheep back to the herd, and can be trained to do everything from fetch a ball to detecting cancer. 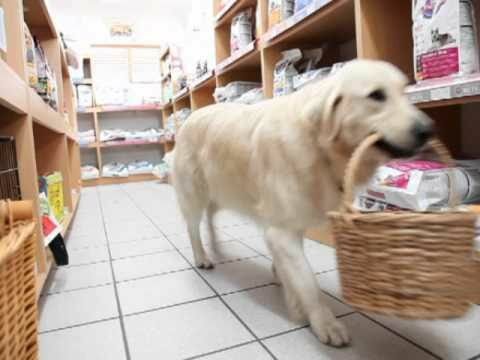 Dogs have been known to do some interesting things, but one dog is more adorable, every day he goes shopping on his own, coming back with his basket of food.